The Pill Bottle Mailer has been one of our most successful 3D Mail pieces since we first introduced it. This is a great campaign if you’re solving a nagging problem that persists for many of your clients, patients or prospects. This works as a self-mailer. All you need to do is fold your letter, affix the child proof cap, slap your mailing label and postage on the outside and drop it in the mail, it’s that easy! Or we can fulfill the entire project for you, just give me a call. 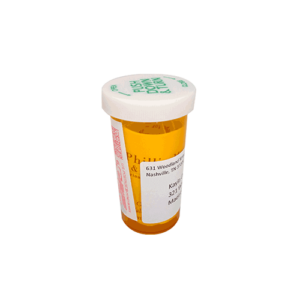 The pill bottle is 3.85″ tall and 1.85″ inches across. Why is it so hard to find a convenient auto shop where you get quality service that saves you time, money and frustration? How frustrating is it knowing you need to take care of your car, but not knowing who you can trust? What if you actually liked and trusted your auto mechanic? My doctor said I must be sick for offering such an incredible opportunity. But I’m willing to put my money where my mouth is and give you ONE YEAR OF FULL SERVICE OIL CHANGES FREE. Just give me a call or come by the shop and you’ll be enrolled in our VIP membership “Car Care Club” at no charge. You won’t have to pay for another full service oil change for an entire year. A $119.00 Value, yours free. It really is what the doctor ordered! But Momma didn’t raise no dummy right? Can you imagine how much it costs me to get a new customer? Just think... I need to advertise here, there and everywhere. And you know that most of that advertising goes right past the people I want to see it. So I figured this letter would catch your attention right away, and I wouldn’t have to spend all that money on advertising that people don’t see, and I would pass the savings on to you. I know that after we’ve taken care of your car that you will know, like, and trust us so much that you’ll bring your car in each time you need work done. And hopefully you will tell your family and friends about us, too! A waiting room so clean your kids can play on the floor with no worries from mom! Here’s what to do to get your FREE FULL SERVICE OIL CHANGES FOR ONE YEAR: Come down to the shop (see the map below) or just give me (Diane) a call at 206-555-AUTO (2886). Just let me know you received this bottle and I’ll enroll you in our VIP Membership “Car Care Club” program, and you’ll get free full service oil changes at no charge for one year. P.S. Getting your free full service oil changes for one year is easy! Just come by the shop or give me (Diane) a call at 206-555-AUTO (2886), and I’ll automatically enroll you into our VIP “Car Care Club” and you’ll get your free full service oil changes for one year!